There is now widespread recognition that the poorest are at the frontline of climate change impacts. Low-income households have less capacity to adapt than those who are wealthier, and 75 percent of the extreme poor depend on activities such as agriculture that are highly sensitive to climate impacts. Unless we drastically change course, an additional 100 million people could live in extreme poverty by 2030 because of climate change, according to the World Bank. That said, ensuring that the least well off will benefit from climate action remains challenging in most countries. Adaptation efforts do not necessarily target the poorest, and low-carbon transitions often face criticism because of concerns they could hurt the poor: one of the main objections to new green technologies and taxation is they can have regressive impacts on low-income households and workers. Yet reconciling eradication of poverty eradication and inequality reduction with climate action can be achieved if the right policies are in place. The commitment to “leave no one behind” (LNB), which is at the core of the 2030 Agenda on Sustainable Development, offers the political opportunity to scale up progress on both development and climate action through a new approach to poverty elimination. While LNB has largely been understood by policy makers to date as a social objective, this agenda has major implications for the ways climate actions are designed, selected and prioritized. 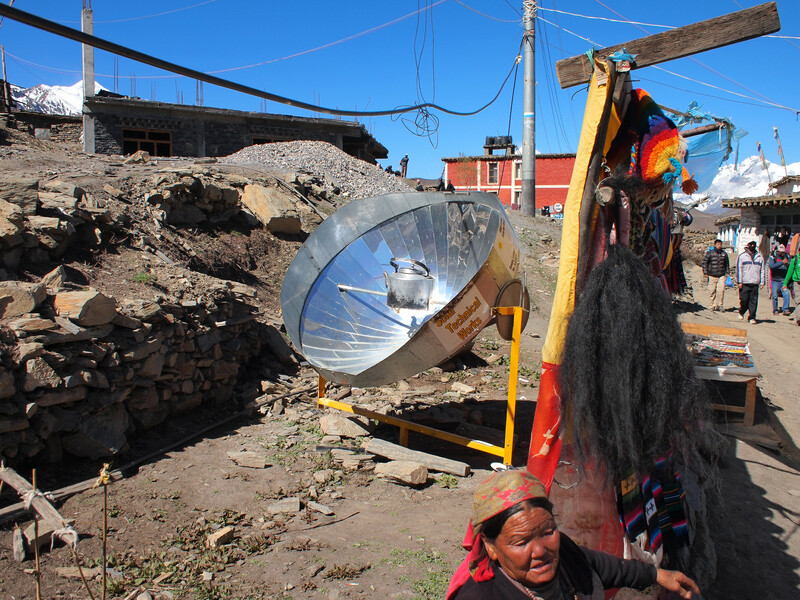 Solar cooker in Nepal. Flickr/IIP Photo Archive. LNB derived from the acknowledgment that a focus on average levels of poverty doesn’t prevent (and can, in fact, exacerbate) a sharp increase in inequalities and that a trickle-down approach to progress has largely proven to be inadequate. 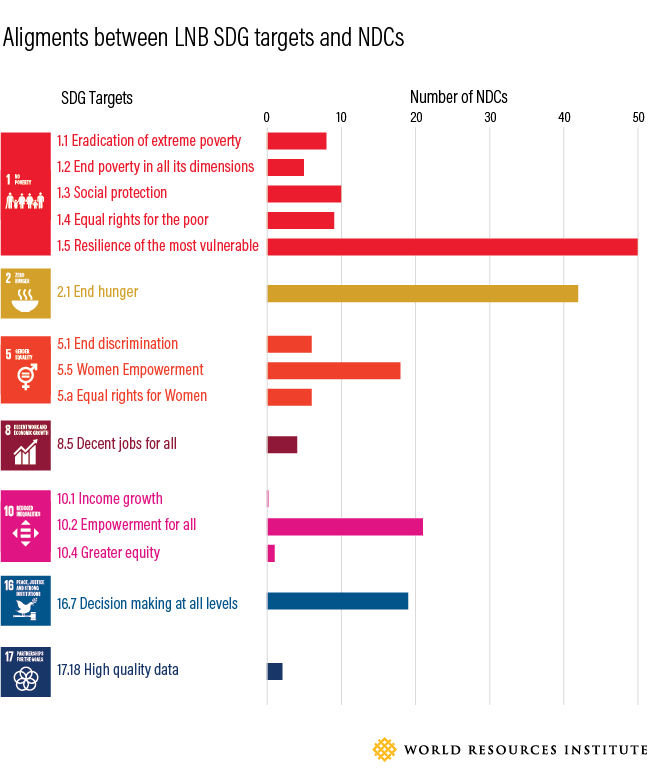 Through the LNB pledge, world leaders not only endorsed historic commitments of ending extreme poverty and curbing inequalities by 2030, but also agreed to “endeavour to reach the furthest behind first.” They acknowledged that none of the Sustainable Development Goals (SDGs) will be met until they are met for everyone. Thus, as highlighted by ODI, LNB requires prioritizing actions for the poorest so that they progress at a higher rate than those who are better off. 1) Including the poor and most vulnerable in decision-making: Climate actions should be formulated in conjunction with poor and marginalized populations, resulting in policies and practices more tailored to their needs and concerns. For example, in Ghana’s Saamini community, the organization of women farmers’ groups and participation by women in discussions on agricultural livelihoods and climate change has resulted in enhanced adaptation strategies and increased women’s role in agriculture production. 2) Targeting the poor and marginalized as implementers of both adaptation and mitigation: Climate action should empower poor populations so that they can actively engage in implementation. There is wide recognition that traditional knowledge from vulnerable communities can inform the design of climate-resilient solutions. In North Central Namibia, for example, farmers’ extensive understanding of agroecological dynamics is essential for designing strategies for adapting to future climate change impacts. For climate mitigation, middle and upper classes and large businesses are frequently regarded as priority actors because they are the largest emitters (e.g. : cleaner mobility solutions for car owners, sustainable production alternative for big companies). However, involving poor populations and orienting policies around their needs can provide important benefits for both development and climate mitigation. Ensuring that the least well-off are part of the low-carbon transition will help them reap the benefits from innovative mitigation actions and ensure that their increasing contribution to the economy does not result in growing emissions. In Indonesia, there is growing understanding that smallholder farmers living in poor and remote areas should be involved in initiatives promoting sustainability practices since they produce an increasing share of the nation’s palm oil. Ensuring that low-income groups can be part of the climate transition requires targeted support. For example, in 2017, the French Ministry of Inclusive and Ecological Transition introduced a Climate Change Solidarity Package to promote an inclusive low carbon transition that benefits the poorest households. The package includes financial incentives and tax credits that help low- income households seize opportunities generated by climate mitigation actions, such as energy efficiency retrofitting and the purchasing of electric cars. 3) Maximizing benefits from climate action for the poor and marginalized: Climate action should be designed to benefit the poorest, to reduce vulnerability and create greater capacity for tackling climate change. In Kenya’s National Climate Change Action Plan 2018-2022, the government has defined as top priority the transition towards clean cooking in rural areas for strong benefits for human health (due to better indoor air quality) and households’ savings on fuel cost, while also for reduction of deforestation and related emissions. 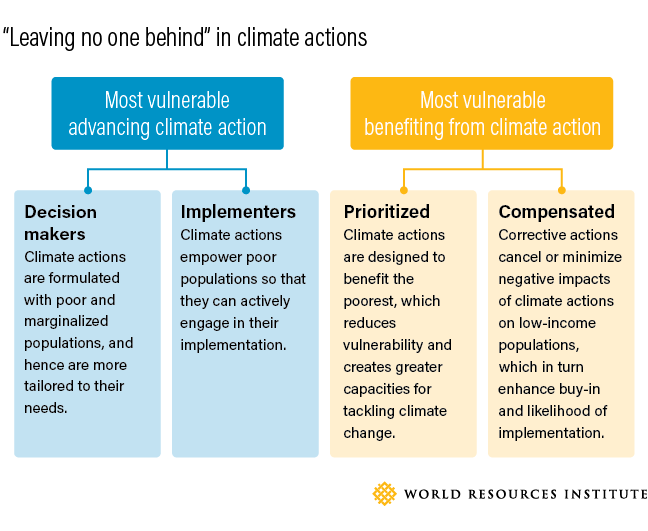 4) Providing the poor and marginalized with compensatory measures: Corrective measures can cancel or minimize negative impacts of climate actions on low-income populations, which in turn enhances buy-in and capacities for their implementation. For example, governments can provide low-income households with allowances to compensate for a carbon tax. In some cases, these can even help reduce inequality. The OECD found that by taking just one-third of the revenues raised by carbon taxes to fund cash transfers, policymakers would make it easier, not harder, for low-income households to pay their energy bills. Although many NDCs highlight the need to contribute to inequality reduction and adopt a gender perspective, few of them include concrete measures to realize those benefits. Even fewer underscore benefits from climate mitigation for the poorest populations. Data from the NDC-SDG linkages database in the Climate Watch online portal shows that the first round of NDCs have addressed LNB-relevant SDG targets in a limited and uneven fashion. The first NDCs are certainly not comprehensive climate plans and were often prepared rapidly with uneven capacities across countries. The coming two years will be crucial for designing climate action that puts countries on track to achieve the goals of the Paris Agreement, while fulfilling the LNB promise. As a growing number of countries start to update their NDCs and formulate “long-term low-emissions development strategies” ahead of 2020, there is an excellent opportunity for exploring the ways in which climate action can prioritize benefits for the poorest. Meanwhile, the 2030 Agenda also offers important opportunities to ensure that LNB is embedded in climate action. Reviews of the implementation of SDG 13 on climate that will be presented at the High Level Political Forum (HLPF) 2019 under the theme “Empowering people and ensuring inclusiveness and equality” can highlight how countries can reconcile climate action and efforts to reduce inequality. An integrated approach is essential to scaling up progress on both fronts.